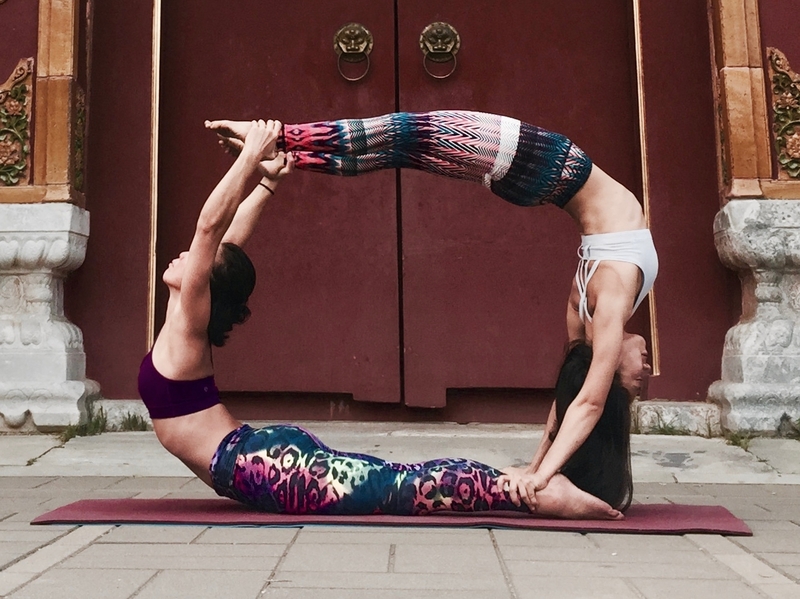 AcroYoga Southbank Jam Sunday 3-6pm price not included normally between £5-£7. Am very honoured to announce that the internationally renowned Wybren da Silva and Trudi Albatros will be coming to London to offer a weekend of intermediate to advanced standing acrobatics. If you are moving into standing acrobatics, learn from one of the best teachers around. Courbette for dummies: how to improve your hand to hand in order to get it steady enough for a courbette; drills that prepare the body for taking off and flight in courbette. Working towards one-foot stands and improving pitches to foot to hand. Unusual tricks to and from standing hand 2 hand and foot 2 hand. ways into hand 2 hand. intro into dynamic acrobatics: courbette, cascade and handspring. Time for guided training towards your own goals. Trudi is a flyer teacher. 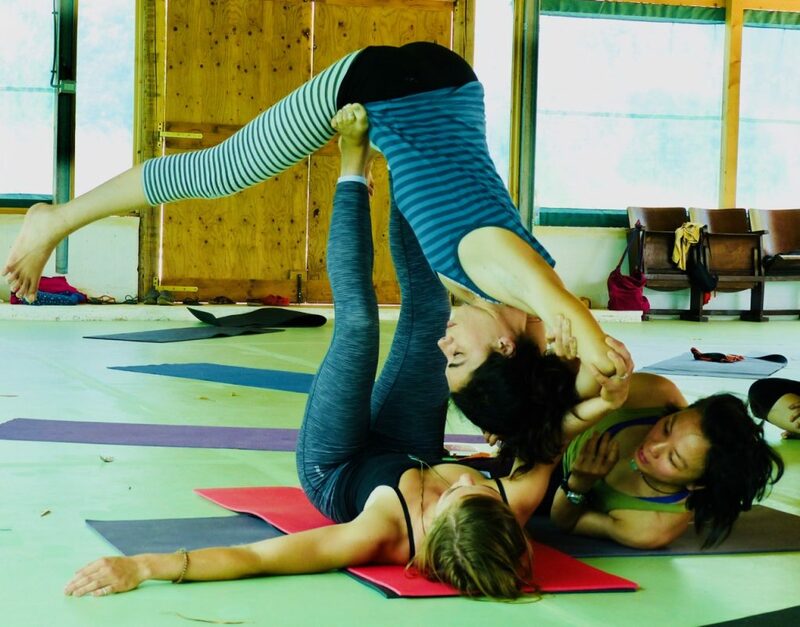 She has been teaching the acro group at Munich University for more than 10 years. Also, she is a regular contributor of workshops at acro conventions, specialising in handstand and preparatory workshops for hand 2 hand and tempo tricks. She has been performed in aerial silks and as part of ‘Traumfänger’ acrobatics all over Europe. * Cancellations 7 or more days prior to the start of the event will be issued a refund less an administrative fee of £10. * No refunds, no transfers, and no credits for cancellations within 7 days of workshop start date. * No refunds or credits for failure to attend or failure to complete the workshop. Cost: It’s possible to pay a non-refundable deposit of £100 to reserve your place. We will make the impossible possible, with linear progressions that will work on embodied conditioning and strength training to help build individual confidence; we will move onto partner calibrations with inversions paving the way for the collaboration involved in partner acrobatics. Priority and emphasis will be given to the art of spotting enabling the learning of advanced acrobatics safe, accessible and fun. Once we have refined our foundations, we will train more precise acrobatic balances, such as foot-to-hand, hand-to-hand and standing acrobatics. Get ready to push past your own personal limits in a fun and safe environment. Please review the prerequisites in this video below. …and if you are not sure if you are ready, just ask us and we support you and find a way to get you ready! One month prior to the course start date: full refund minus £50 processing fee. Within one month to one week prior to the course start date: 50% back. A week before the course start date or during the event: no refund, no credits, no exceptions. When: Friday 19th April 2019, 3pm to Monday 22nd April 2019, 3pm. For bookings please use the following link. 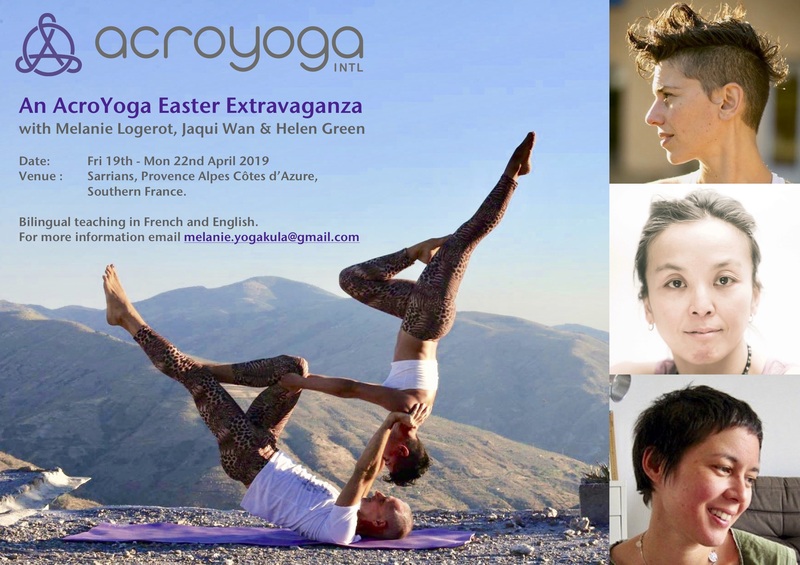 An opportunity to get away over the long Easter weekend and spend it in the beautiful French countryside. A long weekend in the company of three amazing women who are charged to challenge, engage and inform your AcroYoga practice. balances and L basing sequences, that can cater to all levels beginner, intermediate and advanced. 21 hours plus of teaching. Proposed schedule to follow. 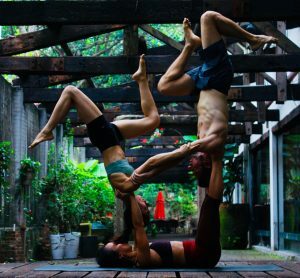 AcroYoga aims to encourage you to move, connect and play. This is a solar offering that delves into the fire of acrobatics. 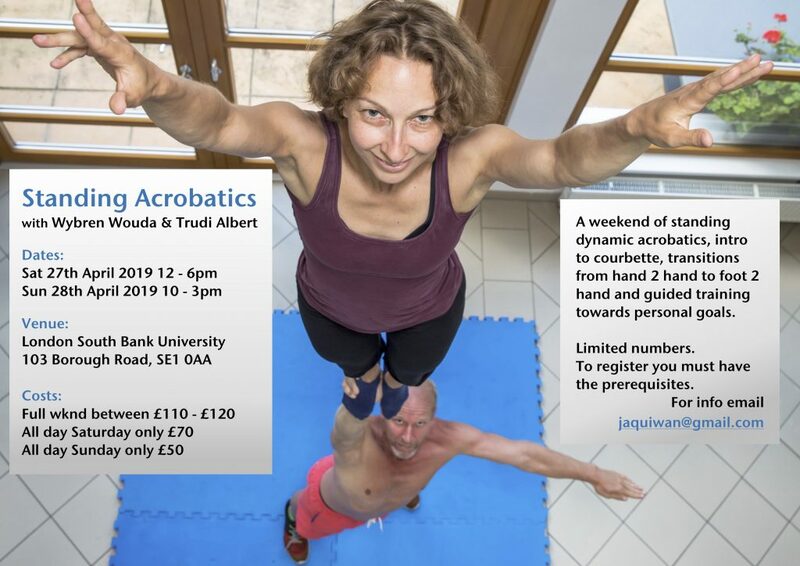 Once we have got you comfortable in your personal body awareness and engaged in your acrobatic bodies we will focus on two themes counterbalances and trio tricks. Counterbalances explore the push-pull nuances of partner balancing; the engagement and mutual calibration that allows the creation of symmetrical and asymmetric structures, shapes and poses. Trio tricks explore the creative refinements of working as a group. There is an added dimension to working as a three; the ability to listen and absorb in order to collaborate are some of the key qualities to successful trio balancing. Come with an open mind and willingness to play. No partner needed. You will learn how to build progressively and be supported in the process. 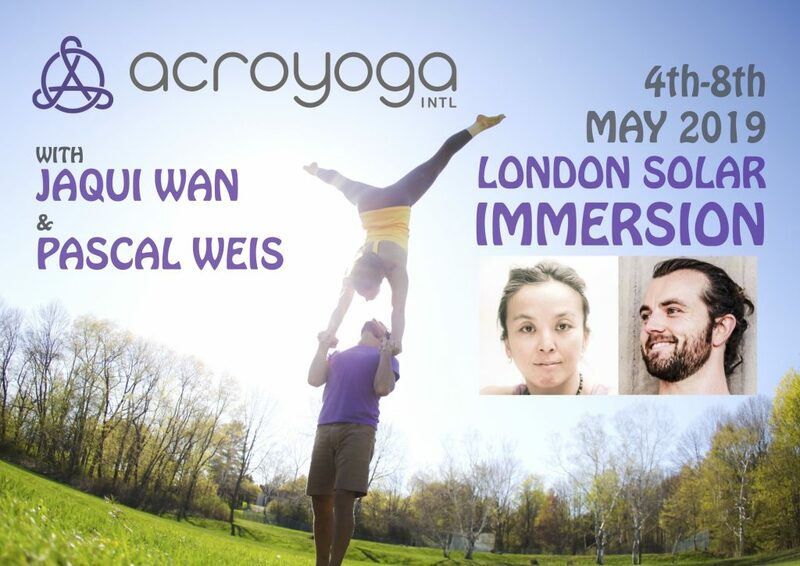 We will explore the lunar side to AcroYoga, allowing us to slow down and cultivate listening and conscious touch. This workshop will introduce you to Thai massage techniques; the use of gravity, body weight, touch and harmonics to realign and release. We will cover the foundations to flying therapeutics that involves a base and flyer. The base acts as a solid structure that enables the flyer to be suspended in an aerial inversion so that the base can work on the back and shoulders. Open to all and especially those with an interest in massage techniques. No partner necessary. You will be working in pairs or in groups of three.